I first heard about this book from Chad Pelley on his blog, Salty Ink (which no longer exists). More recently, I saw it recommended by him again at Atlantic Books Today. This summer, I found it at a used book store in Bridgetown, Nova Scotia. It’s been a little while now since I finished it. Before I got around to writing about it, the holidays snuck up on me, and now I am going to do my best to remember what I thought of it. 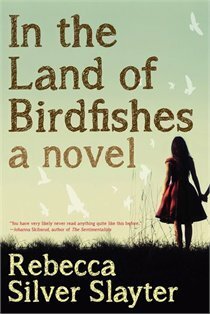 The Land of Birdfishes shows us the damaging power of love. It tells the story of twin sisters, Mara and Aileen, whose mother commits suicide in their home, and, in an attempt to keep them from seeing the horror of this, their father blindfolds them. He then tries to protect them from the world by keeping them blindfolded. After several years, they are rescued by neighbours, but for Mara it is too late, and her vision is completely gone. Thirty years later, Aileen goes north to the Yukon in search of her twin, but instead finds Mara’s angry son, Jason. In a style I love when it is well done (which it is in this case), the story is narrated by several different characters. The timeline also goes back and forth between Aileen’s present story and Mara’s past story. Mara’s part of the narrative takes us back to when she first went away, and it continues gradually to the present. In this way, we gather clues about the life Mara has had up until the point that Aileen meets Jason. Early on, we learn from one of Jason’s friends that he is a liar. This adds uncertainty and suspense to the story as it develops. What can we believe? What really happened to Mara in the end? I had never done anything but try to be nothing, nothing bad, nothing wrong, nothing loud, nothing in the way of other people. Sometimes in my own prayers I thanked God for making me blind so that I couldn’t see how everyday I got a little smaller. I was so tiny now, it was no wonder that the people I once loved had lost me. No one came looking for me because no one looks for nobody. I was a mistake in space, and that was all. A body where the hole of her should have been. And that was why God and my mother took my eyes. To make me disappear. … it occurred to me for the first time that probably love was always imaginary. That it was something two people agreed to put together out of thin air and stare at for the rest of their lives, so as not to ever really see each other. So love wasn’t something you found or fell into, like all the clichés described, like “oh look, there’s some love, over there,” but something you kept inventing out of nothing for each other every day. If anybody ever told you to be careful about wanting things, you’d better believe the f*ck out of them, I’d always known that. I knew for a fact that nobody with a closed hand ever got their fingers cut and so I went around like that all the time, with my hands in fists beside me. I find this book hard to describe. I don’t want to give too much away. The writing and story were both spell-binding. Wonderfully ambiguous characters. Did I even like any of them? Not really. I did feel sorry for them, though. Their stories were depressing but captivating at the same time. And, there is a good ending, one that I didn’t see coming. For a more in depth review of the book, see Jennifer Lovegrove’s review in the National Post. 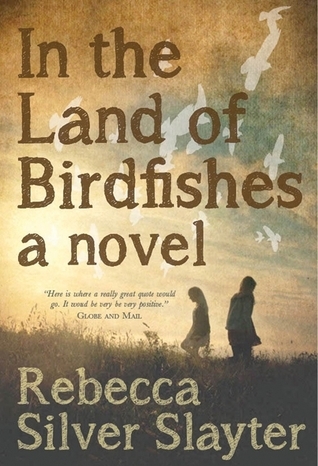 Rebecca Silver Slayter, in the Cape Breton Post, talks about how her first book, In the Land of Birdfishes came to be. Oohh, this sounds good. I love the cover too! Thanks for sharing. This sounds good. I love Cape Breton and I should really read more books by their authors! The article in the Cape Breton Post made me all nostalgic. Maybe you should try this one then! Only the first part actually takes place in Cape Breton, but Dawson City also made for an interesting setting. I don’t know if I’ve ever read a book set in Dawson City before. Wow, it sounds intense, meaning, my kind of book. Reading your review brought me back several years ago when a friend’s classmate committed suicide in her home – her 4 year old daughter and husband were in the other room watching television. Such an unimaginable tragedy, and this book sounds gripping in that it deals with the aftermath of this kind of event. I will look this one up! This one certainly sounds unusual. I will look for it. I apologize if I’m not keeping up with your blog. For some reason, my email has gone back to blocking some blog posts again. For awhile, only Ariel’s was blocked, but now almost everyone’s seems to be. I’ll have to get more in the habit of checking things out to see if people have posted. No worries! I hate dealing with technical problems myself. Hope it gets fixed!